If you missed "Influences, pt.1", click here. Here are more drummers that either pushed me in a certain direction, influenced me with their attitude, or just inspired me with their ability. This post isn't so much in chronological order as Influences pt.1, but I'm filling in some gaps and laying on some of my biggest influnces yet. 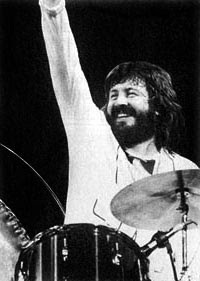 John Bonham was solid. He played like a Mack truck and never waivered. I'm pretty sure they never mic'd his drums, he just hit them so hard, the sounds would leap onto the recordings. His style was an amazing combination of groove simplicity, pattern complexity, and the ability to make all the men that heard him, seem like little girls. Listening to songs like "Kashmir" and "When the Levee Breaks", you can hear his determination to drive the groove into the ground - um, in a good way. On "Rock and Roll" and "The Immigrant Song", you hear the raw energy boiling over. This man rocked, and he left us way too early. 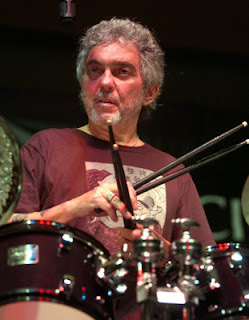 Steve Gadd is a drummer that you have heard over and over, and may not even known it. His recording career has been extensive and his ability to bring something new to the table has been remarkable. For instance, his groove on Paul Simon's "50 Ways To Leave Your Lover" is one of pop music's most unique rhythms. And I don't know whose idea it was to use two pair of sticks to get the sound he got on "Late in the Evening", but that's genius. I saw him on PBS the other night playing for James Taylor, and in his sixty's, he's still controls the time like nobody can. He is the master. He can play anything he wants to play, with his eyes closed and both arms tied behind his back. My wife even knows his name. Some of my favorite recordings he's done include: Joni Mitchell's "Wild Things Run Fast" album, Kenny Pore's "Inner City Dreams", and Sting's "Ten Summoner's Tales". Back in high school I started listening to fusion a lot. 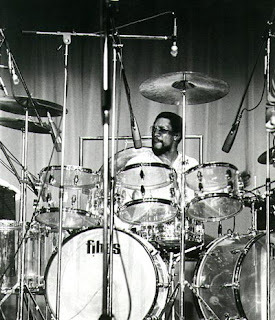 Billy Cobham (L) was one of the fusion drumming "gods", and he played like he had four arms. 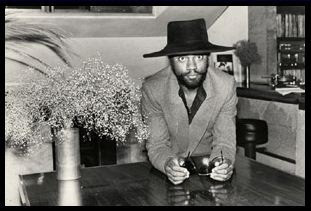 Lenny White (below) was the first drummer I ever saw in clinic. His days with Return To Forever were astounding. Dan Wojciechowski was a good college friend of mine. I can vividly remember the first day of classes at North Texas, freshman year. Dan was the most positive person I had ever met up to that point, to the point that I thought he was kidding. But it wasn't an act, and his positive outlook transformed the percussion department while he was there. His playing was scary. He came in at 18, playing like a seasoned veteran. By third year, he had the One O'Clock Lab Band chair and kept it until he graduated. Dan's playing left an impression on me, but more-so, his attitude. Because of him, even now when asked, "How's it going?" I usually respond "great" instead of "okay". Since school, he has played behind many big acts, including Lee Ann Rimes and Olivia Newton-John. Last time I saw him was at my wedding. Hopefully our paths will cross again soon. 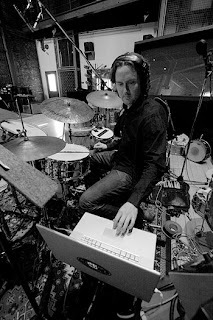 Matt Chamberlain was another school chum for a while, until he got his break with Edie Brickell and the New Bohemians, then he went on to play for the Saturday Night Live house band for a season. I saw him after he quit the gig at SNL and asked him why. He said, "You're playing blues for 5 minutes at a time. I couldn't take it anymore." 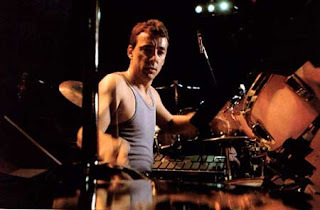 Wanting more has paid off for him, 'cause he's had an incredible drumming career, playing for everyone under the sun (see his site), and will be doing a world tour this summer with Tori Amos. I remember hanging out in his practice room one day at school. He found out that I had not heard Bill Connors "Step It" album. He shoved it into my arms and said, "go and make a copy of this right now." Good guy. Dale Baker is someone I call one of my "lifetime friends". That's the kind of friendship that can go a year without any talking, and when you do again, you can pick it up right about where you were before, missing no beats. 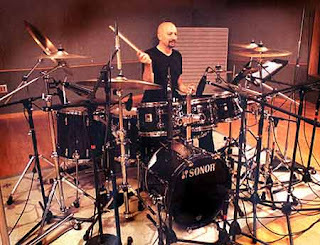 Other players that have inspired me include (in no particular order): Steve Jordan, Sandy Nelson, Tony Williams, Peter Erskine, Bill Bruford, Carlos Vega, Dave Weckl, Terry Bozzio, Larry Mullen Jr, Alan Dawson, Dave Grohl, and Abe Laboriel Jr. You can read about these and many more at drummerworld.com. That's where I got many of my pics for these "Influences" posts, btw. I'm not going to review the show, but I will recommend it highly to you. 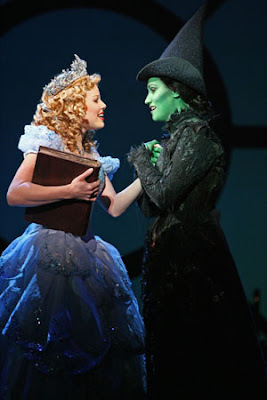 The cast was incredibly talented. The humor and music are both great. 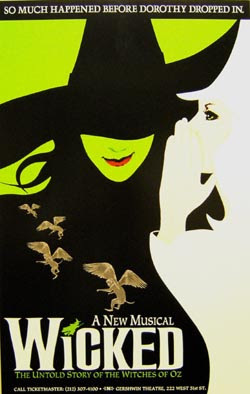 If you get the chance, see it. Strictly Background, Jason Connell's great feature documentary that I worked on in the fall is finally premiering at three film festivals this and next month. 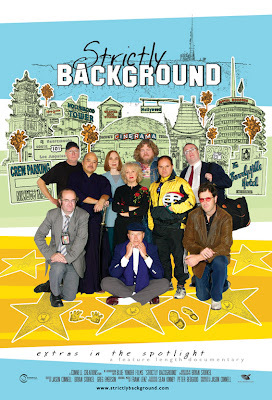 Strictly Background is a heartfelt feature length documentary that explores the charm and determination behind some of Hollywood's hardest working actors, professional "extras." Following ten background actors, the film examines life on and off set as they attempt to make a living as a face in a crowd. Strictly Background is the true story of the struggle to stand out. Go to the site and click on "screenings" to see the three festivals currently slated, and check out the trailer too. 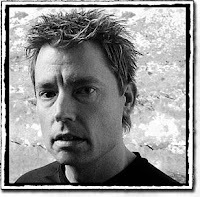 (You can also go to the "filmmakers" page for interesting bios of the crew - you might recognize the sound dude.) If you're in the LA area, be sure to make it to one of these festivals. This is a link to a previous post concerning backgrounds in the movies, relating to both sound fx and people. I found these a few months ago, but honestly can't remember where. 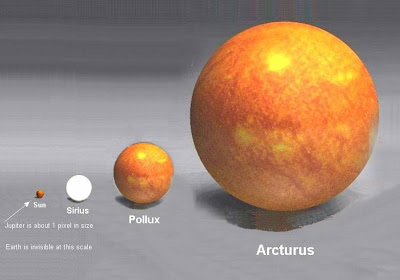 Anyway, this aught to keep things in perspective for you. "Whenever I doubt God's existence, I think of the universe. 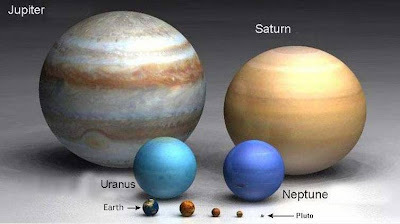 I think of all the planets and stars and everything else out there. 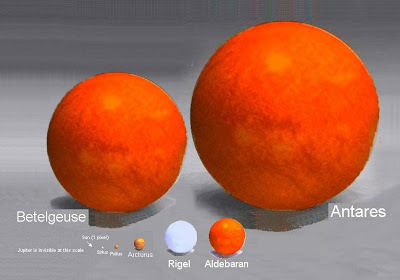 Then I think of the formation of them, including all the theories people have concerning the universe's formation. No matter what you believe, evolution or creation, SOMETHING (read: someOne) had to first put it into motion. Go back to the very first moment matter formed or life awoke. 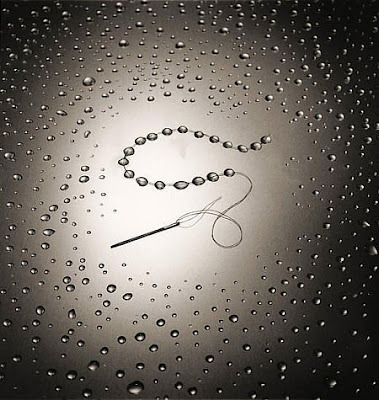 The first molecule predates the theoretical 'momentum' of evolution. Someone HAD to be behind it, in other words, created it. That's why I know God exists." Well, that rings true to me. 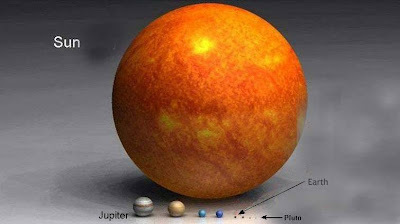 And since creation, God's creativity has trickled down through all of creation/nature, even allowing His creations (us) to be creative themselves. That is a secure God, and His creativity is a gift for which I'm thankful. This is kind of a natural segue from the previous post, because Steve Lee's "Hollywood Lost and Found" website contains links to several great vintage film locations. Besides the info on locations, his site has lots of Hollywood history documented there concerning: film sound, movie props, trivia and tributes, etc. It's just a good resource for Hollywood info that is hard to find elsewhere. You may remember my "Wilhelm Scream" post some months ago, well, this is the site I stole (but gave credit for!) most of my information. As a matter of fact, that post is what got me aquainted with Steve in the first place. 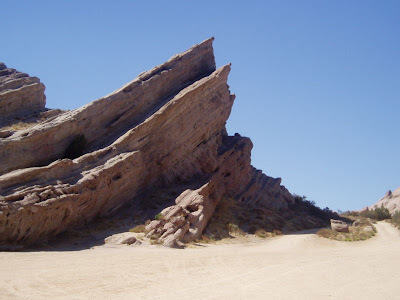 We went hiking yesterday at Vasquez Rocks Natural Area Park. It's about 20 minutes from our house, and free, so right there two major requirements for us are met. We love to hike. We have some great trails and hills within walking distance to our house. But, I also love going somewhere you can literally see the scenes from movies run in your head as you walk around the place. 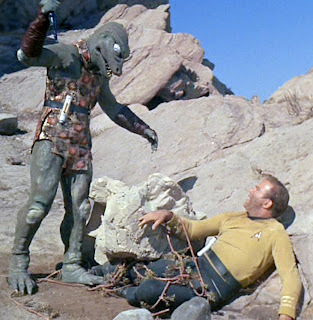 For instance, we went up the large rock (pictured above) where Kirk fought the Gorn in the Original Star Trek episode "Arena". (obviously pictured below) We ate our lunch up there. 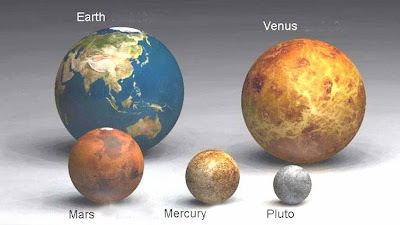 Thank goodness, no aliens came. The park is about 750 acres, and LOTS of rock formations and trails, so you could spend days going through it all. The thing you have to watch out for is, usually when you get to the top of something, your four-year-old will demand to be carried back down. Just an FYI. Here is a partial listing of movies that were shot at Vasquez. 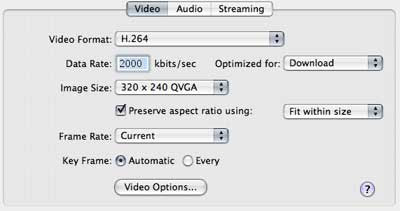 Courtesy of the LA Final Cut Pro User's Group website, here is a link where you will be clearly shown how to output your videos for the best possible quality on YouTube. We've all seen really bad compressions that get posted, well, here is the right way to do it. Be sure to watch the example they gave after using the process. It looked GREAT for YouTube. If you ever post stuff to that (or any other video-hosting site), then check this out. If you've ever been stumped by the terminology of those geeky sound dudes, here's your chance to get even. Filmsound guru Larry Blake has compiled this "handy-dandy" film sound glossary to catch you up with them, and you may even find a few terms they don't know. It's called What's a Binky?. The Hollywood Reporter has announced today that Cate Blanchett has signed on to star in the next highly-anticipated installment of the Indiana Jones franchise. The film is set to start shooting in June '07 and release in May '08. I have been looking forward to this next "Indy" film for years, and adding Cate Blanchett to the cast is only major icing. She makes everything she is in better. Click HERE to read the HR press release. The Daytime Emmy nominations were released Wednesday, and to my surprise, we received five in our category. The sound team I work with at WB has had some success the last few years in regards to these awards, and a win in June would be our fourth since I started there 5 years ago. The actual category is called "Outstanding Achievement in Sound Editing - Live Action and Animation". Go HERE for a listing of all of the 2007 nods. 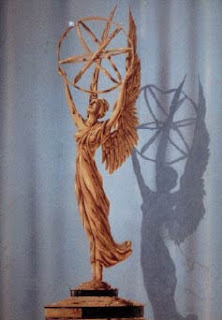 Pictured above is the model for the original "Emmy" design. Go HERE to read a very interesting and brief history of the statue. Chana is excited, 'cause it means getting to wear another killer dress. GO HERE to see what she wore last year. It all goes down June 14th, so keep your fingers crossed, and I'll keep you posted. 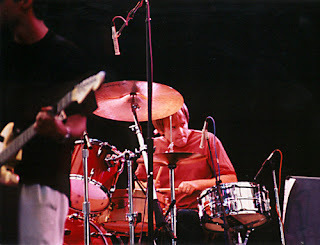 Sometimes I can go a long time without giving any regard to the influences I have had as a drummer. I just play, enjoy it, and let the experience happen. Sometimes I like to reflect on the major influences I've had, and give credit where it's due. Their respective styles are a part of my playing. I thought I'd chronologically go through a short list of my major drumming influences. I'm sure I've had many more drummers rub-off on me than that will be listed here, but for brevity sake, I'll hit the highlights. Peter Criss: I hate to admit it, but probably the least talented drummer on this list is the one that got me into drumming in the first place. My Jr. High friends and I wanted to start a band "just like Kiss", and I was to be the drummer. 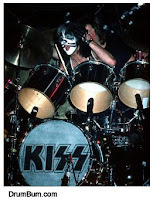 Our Kiss tribute band never took off, but I started learning the drums just the same. (CLICK HERE for the highly entertaining story of how I first got into the Jr. High school band) I learned a lot about simple rock beats while playing along with Kiss records, but it wasn't long before my eyes were opened up to bigger and better drum idols. Still, I have to give him credit for getting my attention first. 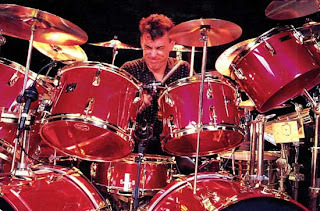 Neil Peart: My first rock band I played in was in 10th grade. I asked my Dad's permission to play with these guys. He chuckled and said "alright." We were horrible, but through them I was introduced to Rush for the first time. I don't think I ever put on a Kiss record after that. 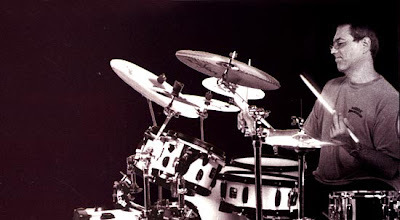 I spent hundreds of hours playing along with Rush records, figuring out his drum parts, and reading everything I could get my hands on about Peart and his Tama drums. His precise style was good for me at the time. It taught me discipline and strength. He was (and still is) a monster. A couple years later, still in high school, I joined a very good band that covered a lot of Rush songs. We had a lot of fun, and by 16 I got a few write-ups in a local Dallas music magazine. I thought I'd made it then. Righhhht. I don't listen to a lot of Rush these days, but I appreciate how Neil Peart has always persued more knowledge and skill in his craft. Stewart Copeland: I have recently commented on his greatness. Go here to read about it. I will add here that his approach in striking a drum is inspirational. He never hits anything without every ounce of his energy involved. 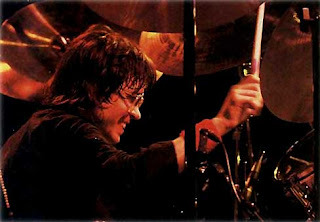 Steve Smith: (best known as the original Journey drummer) A great, great drummer. Extremely versatile. But, his influence on me came more from a short conversation than anything else. I had the fortune of meeting Steve during my freshman year of college. At the time, he was touring (post-Journey) with his fusion band Vital Information. At North Texas, we had heavyweight players come through often, and I was able to spend a few minutes talking one-on-one with him. He talked about feel. To him it was more important than all else. His simple approach to making a song FEEL better was a revelation to me. It opened my eyes, because most of the players I was listening to were not 'feel' oriented players, but technique oriented. I started listening to drummers in a whole new way. Jeff Porcaro: Talk about feel, this man invented it. Best known for his role in the band Toto, he revolutionized the way we all play a shuffle beat. I can still remember looking at the transcription for "Rosanna" in Modern Drummer magazine, and wondering how he ever came up with that. Some of my favorite recordings he did were with James Newton Howard. It was an audiophile project that included most of the Toto rhythm section, Joe Porcaro on percussion (Jeff's Dad) and JNH. Crazy over-the-bar 12/8 patterns and GREAT linear grooves. I saw Toto in concert in the 80's. He made an impression on me when he DIDN'T play a solo. It was a time when show-offs and chop-monsters displayed their goods. Well, here was one of the best, and he chose to play for the music, keep it straight-ahead and keep his solos to himself. This spoke volumes to me, and I learned that even though you CAN go crazy, it doesn't mean you SHOULD go crazy. Let your time keeping and feel speak for itself. Huge lesson. Next time I'll get to the rest of the list, including the drummer I believe to be the most well-rounded player out there. I'll also discuss some the teachers in my past. Check out THIS LINK for some very creative photographs. Spanish photographer Chema Madoz sees things from a different perspective, and I like his eye. Chana and I celebrated our 17th Wedding Anniversary a couple of weekends ago. We spent most of it in Santa Barbara, which is about 1.5 hours away. It's far enough away to feel like you're getting away, and close enough to make a day-trip of it. We had a great relaxing day. 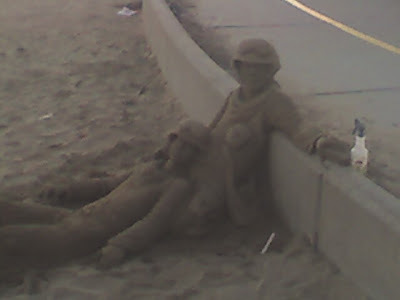 Toward the end of the day we saw this sand sculpter had just finished up his newest creation: The Wounded Soldier. The sun had just set, so the lighting here (and my sub-par phone-camera) doesn't do the work justice. The detail was perfect. These guys looked alive, well... for sand people. 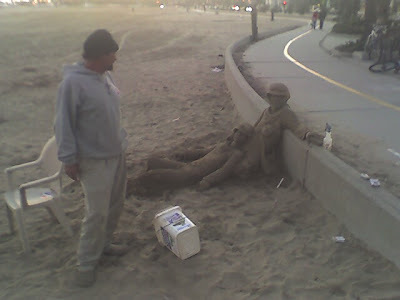 The artist said that he has done a different sand-sculpture everyday on this beach for 19 years. (just off of Stearns Wharf) He said that on average, they last about 5 minutes after he leaves, 'cause some really cool person comes and kicks them over or whatever. Too bad they can't last longer, but I guess in a way, he must get a kick out of having a fresh, brand-new canvas everyday to work with. That says a lot about a man who is willing to create such fantastic art, KNOWING that it's life-span is extremely short. He must constantly say to himself, "there's more where that came from." I would like to have that attitude when I'm creating, even though I use more permanent mediums. But to have the confidence in the creative gifts in me, to flow unhindered and in excellence daily; that's the faith I want to have in the source of that creativity. No matter how long his sculptures last physically, I know that the impression stays with the people who see it.